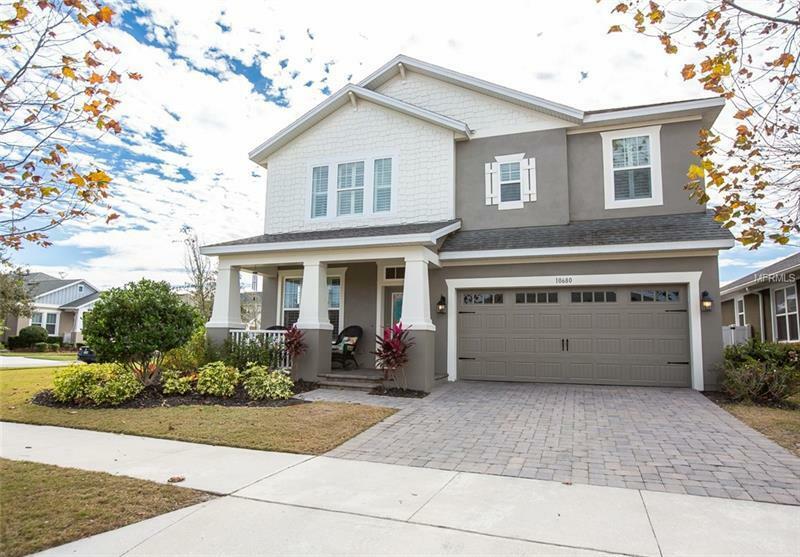 BRIGHT AND BEAUTIFUL DAVID WEEKLEY POOL HOME ON HUGE CORNER LOT in Randal Park near Lake Nona. Amazing open concept home offering lots of natural lighting! The spacious kitchen features granite counter tops, stainless steel appliances, large breakfast bar as well as spacious breakfast room overlooking the great room. The French doors lead to an amazing outdoor living space with HUGE screen enclosed saltwater pool - solar and gas heated and covered lanai w/brick pavers perfect for Florida living! Stairs to second floor lead to large loft/bonus room which can be converted to a 4th bedroom (Office on first floor may be converted to 4th bedroom as well). The over-sized Master Suite and two additional bedrooms also on second floor. Plantation shutters throughout the home! The Randal Park community is LOADED w/amenities to include 8 parks, 5-acre central park, community center, resort pool, splash park, open-air pavilion, playgrounds, fitness center, & biking/hiking trails. Just minutes to Medical City, USTA, VA, restaurants & more! Conveniently located to airport & easy access to 528 & 417.